I am a big fan of curry and coconut, combined or by themselves. This fish has lots of great flavor and can be made with things you probably already have in your pantry. The sauce is quick to whip up and can be made right in the baking dish to avoid dirty dishes. By the way, this sauce is also great as a marinade for chicken. For this particular recipe I used tilapia but you could definitely use any flaky, white fish. I always end up buying tilapia because it is so neutral in flavor… and cheap. The Perfect Pairing for this fish is the Caribbean Bean Puree recipe I featured yesterday. I love to take a bite of the fish with the bean puree. The flavors and textures are great together. You may also want to serve it alongside some rice to soak up the yummy sauce. Since you only need ½ cup of coconut milk in the fish sauce you can use the leftover to replace some of the water or broth to cook the rice. In medium sized baking dish combine the first 9 ingredients, through cayenne. Whisk to combine. Add the fish, cover with the marinade. Let the fish marinate for at least 30 minutes. Preheat oven to 400 degrees F. Cook fish in marinade for 12-15 minutes, until fish flakes easily. Serve with cilantro and toasted coconut. Wow Lindsay! Was this a fabulous recipe! Really easy too. 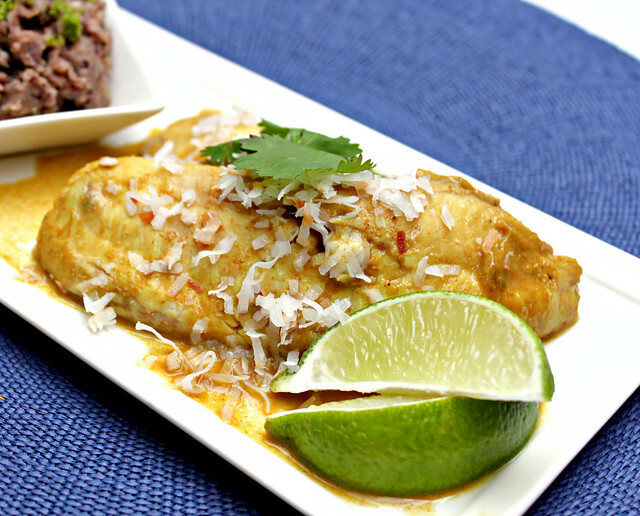 I used Hake (mild, white fish)instead of Tilapia but otherwise followed recipe exactly including cilantro and coconut. I will try the suggested Bean Puree as well. YUM.